WHAM! POW! Polls Aren’t Just For Pop Anymore! As well as the Freaky Trigger pop poll, masterminded by Kat, I thought I’d try something else – a Freaky Trigger COMICS POLL. This will work in exactly the same way – you list up to 20 comics you’ve enjoyed most in 2014 and send them to me before the end of this year. And by “me” I mean freakytrigger@gmail.com (so Kat doesn’t get a load of comics ballots and I don’t get any pop ones). That’s basically ALL YOU NEED TO KNOW, so get those votes in. 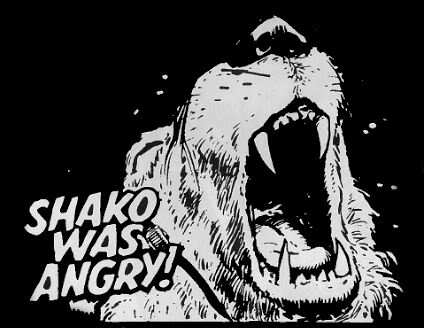 But if you CRAVE details like our chief sponsor SHAKO* craves MEAT then there are more below the cut. What’s eligible? Anything that came out in 2014 and included stuff that had not previously been published in 2014. Are we going to strictly check that it did? Probably not TBH. Single issues or ongoing titles? Obviously for original graphic novels, one shots etc. just give the name of it. For ongoing series, we’ll be listing the title as a whole. If you want to pick something from an ongoing title then you CAN specify a single issue if you want and we’ll try and mention that, but your votes will be rolled up into the title. What about reprints and collections? Consider the amount of published-in-2014 material and vote as your conscience decides. What about anthologies? We WILL consider anthologies separate from what’s in them – so a vote for a 2000AD series will not be rolled into a vote for 2000AD. But you could also vote for 2000AD as a whole. Can the comics be from anywhere? They can. Will you put my email address to nefarious use? We will not. Do I have to pick 20 comics? No! Pick as many as you like, but no more than 20 please. When will the results be up? January. I expect I will list anything that gets more than one vote, since I suspect this will be a highly limited electorate poll. And I’ll put all the one-vote suggestions in another post somewhere. No vote will be wasted! *the only bear on the Pazz & Jop email list. OH YEAH web comics count of course.